The following post consists of a press release that was shared with the CopBlock Network by Matthew Albert, via the CopBlock.org Submissions Page. Albert is the attorney for India Cummings, who died under suspicious circumstances while in custody at the Erie County Holding Center. Officers Involved: Erie County Sheriff Timothy Howard and all sheriff’s deputies assigned to the Erie County Holding Center. Buffalo, NY – India Cummings, 27, was in the throes of mental illness, clearly incapacitated and incapable of taking care of herself when she was put into custody at the Erie County Holding Center on February 1st, 2016 after a series of irrational actions. Despite frantic efforts by family members and her attorney to transfer her to a hospital where she could have been stabilized, she was stashed away mysteriously in the Holding Center for 16 days. 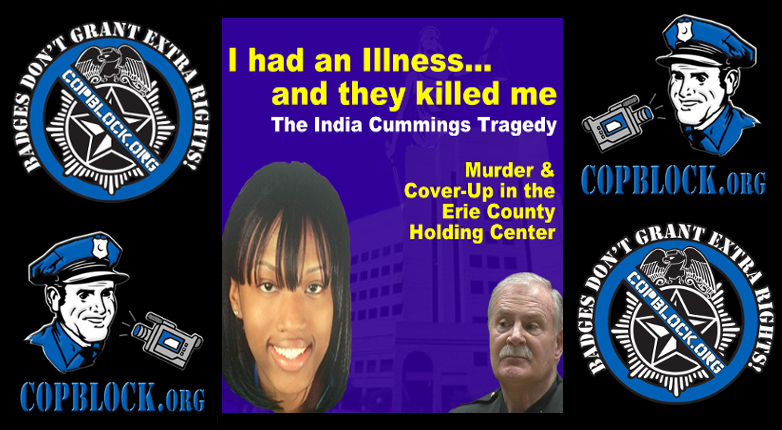 On February 17, 2016, Erie County Sheriff Timothy Howard states a “medical event happened,” and India was transported to Buffalo General Hospital. However, by then…it was way too late. Upon her admission, she had a broken arm, broken ribs, severe dehydration, a blood clot in her leg that would have required the amputation of her leg, and her kidneys were failing. She was brain dead and in cardiac arrest. Sheriff Howard fails to mention what conceivable medical event occurred that could have caused all those conditions. On February 21, 2016, Ms. Cummings’ remaining organs crashed, and she died. Howard and Acting Erie County District Attorney Mike Flaherty have done exactly what you would expect them to do when a young black girl dies in such a tragic and suspicious manner in county care…absolutely nothing. Howard went on record today to say he is “more than satisfied,” by everything he has seen so far relating to her care. However, when a clearly incapacitated individual is put into County custody, it is the County’s duty to care for her, as she cannot care for herself. Here, best case scenario, under County supervision, India was allowed to wither away and die in a three-week period, having nothing in her system upon her admission to the hospital. Legally speaking, That conduct would constitute criminally negligent homicide. Worst case scenario, India was beaten until there was nothing left and deprived of necessary food and water in that 16 days time frame. That conduct would amount to intentional or depraved indifference murder. Either way, there is criminal liability present in this girls’ demise. If this was some white doctor’s kid who was in such a precarious mental state, he would have been hospitalized as opposed to left to rot in jail. An autopsy has been done by the County’s Medical Examiners, who unsurprisingly are clinging tight to the results. This matter is now being reviewed by the State Commission of Corrections. The Erie County Holding Center has been under federal oversight due to their track record of abuse and poor supervision of prisoners in their care. ← Know Your Rights: Can the Police Make You Get Out of Your Car?